You can start any time, don’t need to wait till Jan. 1 if something is beckoning to you. Extra brownie points for using stash yarn (for purposes of this GKA, stash yarn is something you bought 6 or more months ago). You can do one project a day, or ten. The only limit is the size of your stash and the number of needles you can locate. Daily checkin, with pictures, is highly encouraged. And being the joiner I am…coughNOTcough…I decided, what the hell! Why not. Though, I don’t know what’s more pathetic; that I have yarn enough to do a 7-day floozy-along every month for 6 years, or the fact that I almost didn’t participate because I didn’t have enough knitting bags to hold all my projects. Because, you know, there can be only one project per bag. No intermingling or kanoodling on my watch. If they cohabitate they’ll start getting all sorts of ideas and then it’ll be anarchy, I tell you! Oh, where was I? Floozying, that’s right. So, New Year’s Eve didn’t find me out at a party, whooping it up, or snuggling in. No. Much to the SBH’s disappointment, it found me stash-diving, gadget-finding, needle-searching, notions-gathering, and bag-improvising in anticipation of the week. yup, my very own Charlise. I mean, that should have been a no brainer right? So why did it take me so long to figure out how genius it is t use my own yarn for my own designs whenever possible? I also found an error in the charts right away. I’d call that progress! My Ravalry friend, CeliaAnne has a new design out. Now, as she designed these using some of my Dizzy Blonde yarn, of which I have an ample supply…go figure… I volunteered to test knit these. 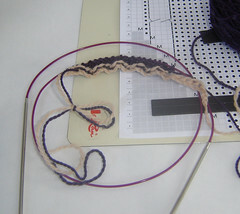 Instead of raiding my inventory, I frogged the Cat Face Lace Sock revamp and reclaimed my Momoze yarn. The yarn and the sock pattern were not meant for each other, and I figured my Momoze would be much happier on my hands than on my feet anyway. What cat wants to be walked on? OMG, I LOVE this pattern!!! I’ve never made mitts before, but these are very easy, but fun! These became my nightly TV knitting, and before I knew it, I’d knit one and now I’m about 1/2 of the way through the second. 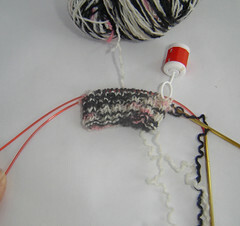 And you can get 2 pairs out of 1 skein of yarn. The Missouri Autumn Mitts pattern is available on Ravelry. CeliaAnne also has a Etsy Shop, and I’m hoping she’ll list it there too for any non-ravelers. It really IS a fun and easy knit. This Saturday will find me at the Griffin Dyeworks First Annual Fiber Frolic in La Crescenta, for a day of frolicking with fiber and friends. If you’re local, come out and join us! And that’s all I’m gonna say on THAT subject. My WIP’s share bags. They’ll just have to content themselves with conspiracy theories. Floozying! Great idea. I think I have enough needles to cast on all my stash, which is sort of scary, now that you made me think of it. Have you seen Washburne in that cellphone/DVR ad? The guy laying on the ground during the bank robbery giving a thumbs up? THAT is a creepy cat picture lady………. Projects must be in different bags. There’s no telling what the worsted weight might do to the defenseless lace weight. The horror! Perfect lolcat for this week. I’m planning on going to the Fiber Frolic so I may see you this weekend. Zombie! You be alive! How are things? I know, I’ve been busy too. Too many WIPs here and not enough arm. 😀 The Floozy thing is perfect for you. Hmmmm… maybe I should host a KAL with Dizzy Blond stuff. Nah… I wouldn’t finish it anyway. 😀 Happy Saturday! Man I have to leave a little while and everything changes. Oh well, I guess I can get used to it. You could make one of your projects a knitting bag. Sort of a two-fer…..